Oooooo shiny! If you're like us, you probably love streamlined gadgets that are machined from metal, have some form of lighting and are designed to sit atop of your desk while you fondle them. That is exactly the sole purpose of Griffin's newly revamped PowerMate. Griffin's iconic multi-function controller knob, which was first introduced back in 2001 and has since made cameos in numerous futuristic blockbuster movies due to its timeless design - is now even sleeker and more beautiful than ever. The newly redesigned PowerMate Bluetooth is an even more stylish multi-funtion power tool for the novice and pro computer user. It's also now fully wireless thanks to buil-in Bluetooth connectivity, hence its name. Described as a clickable knob by perphase everyone that comes in contact with it, the PowerMate Blueooth can be programmed to execute a wide array of key commands in virtually any application. Users can streamline routine tasks such as editing home movies like a pro, scrolling through long documents, or creating audio masterpieces. 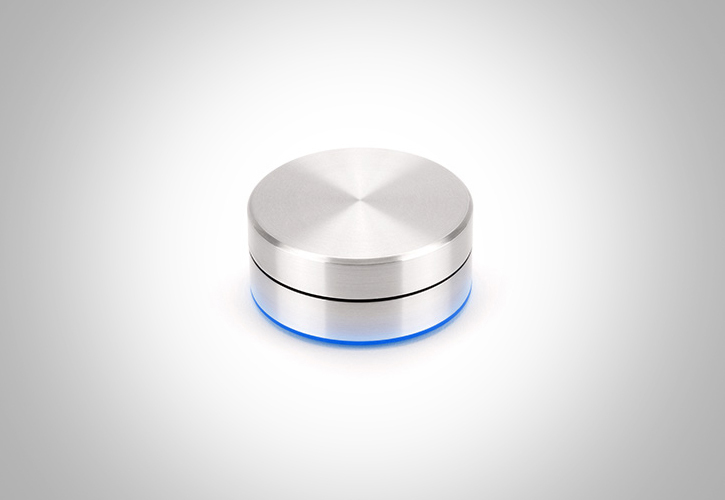 This gleaming brushed aluminum desktop peripheral is most recognizable by its blue glowing base. Users can control the behavior of this pulsing LED to provide system status at a glance. Multiple PowerMates can be paired through Bluetooth, with no entangling wires, allowing users to assign various commands to each. It'll be available later this summer for $60.